It's rare for a Vermont theater company to produce a world premiere by a major American playwright, but Northern Stage defies the odds. The company's aspirations to find and develop new work come full circle in Orwell in America by Joe Sutton. Part of Northern Stage's first "New Works Now" play-reading festival in 2014, it's the first of those plays to receive a full production. Most people who've been through an American high school know the name of George Orwell (1903-50), the English novelist, essayist, journalist and critic who championed social justice and opposed totalitarianism. The Times of London ranked him second in a list of the "50 greatest British writers since 1945." His two most famous novels, Animal Farm and 1984, are still widely taught in American schools nearly 70 years after their first publication. Yet Sutton's play shows new sides of the writer — in part by imagining a trip he never took. "A play about a historical character is only relevant if it's timely, if it has something to say to us," says Peter Hackett, director of Orwell in America, in a phone interview. "What attracted me is that the themes and the politics [of Sutton's play] are unbelievably contemporary." For his part, Sutton says in a phone interview that he read Orwell in school, but when he returned to the author in the middle of his own career, he found himself struck by the power of Orwell's ideas and intellect. "We use that descriptive word 'Orwellian,'" the playwright says. "Everybody appropriates that word for their own use." Indeed, "Orwellian" is part of our vernacular, brandished by commentators on either end of the political spectrum. But what do we know about Orwell himself? According to Sutton, even "avid readers who know his two great books don't know much about him — like the fact that he died at age 47." Sutton saw this as a great opportunity, he goes on. "We don't have a fixed idea about Orwell" as we do about other literary giants such as Ernest Hemingway or Norman Mailer, he points out. "People don't have predetermined views about him." The playwright recognized that this lack of preconceptions would give him the freedom to present Orwell's ideas through the medium of a fictional construct: In reality, Orwell never set foot in the U.S.
Set in small-town America just after World War II, the play follows Orwell (Jamie Horton) on a book tour for his dystopian novella Animal Farm. His publisher sends with him a smart, attractive young woman named Carlotta (Allison Jean White). Ostensibly, she's there to guide Orwell from hotels to speaking engagements and from one town to another. But her real task, at the behest of the publisher, is to dissuade the author from articulating his socialist views to American audiences, who conflate his democratic socialism with communism. Carlotta's considerable persuasive powers have Orwell enthralled. While its events are invented rather than historical, the play serves as an exploration of ideas in an intimate context. 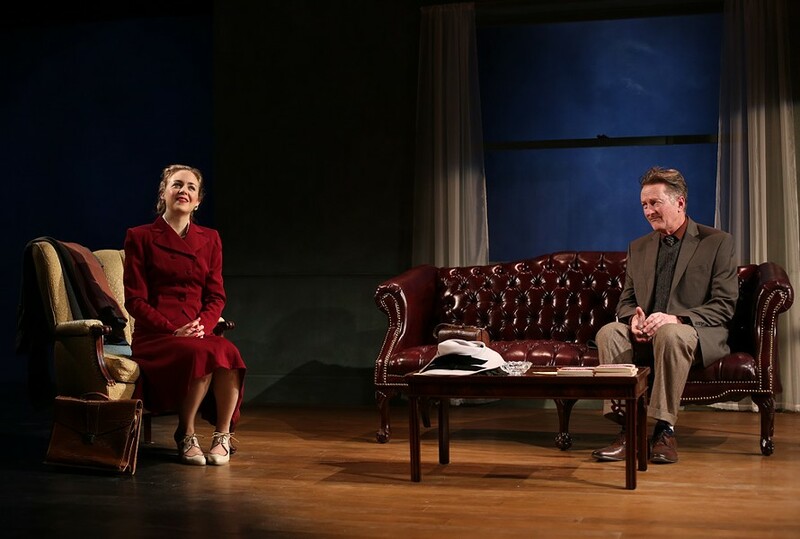 Sutton's plays always reference politics, and Orwell is no exception, but here the relationship between Orwell and Carlotta drives the drama. Sutton's thorough research and masterful dialogue illuminate his work's relevance to contemporary politics, where socialism is still misunderstood and misrepresented. What audience members may not know about Orwell they begin to discover when he introduces himself as Eric Arthur Blair — the writer's real name. When Orwell first steps on stage, he is addressing the audience on the first stop of his book tour. Horton seems to be breaking the fourth wall until we realize that Orwell is speaking to a fictitious audience that sits in our place. Sutton then moves the action from the public arena (book-tour appearance) to a private one (the hotel) where Blair/Orwell and Carlotta can review his performance and the audience's reaction. "I've added a huge wrinkle in this [play], in that time and place are dealt with rather cinematically," Sutton says. "[The characters] go back and forth between public places like a VFW hall and the privacy of a hotel room, and it has to be very clear how they're moving through time in this two-week book tour." Director Hackett helps make those transitions seamless, and they sometimes occur rapid-fire, always unannounced, even in mid-sentence. Lighting designer Stuart Duke adroitly ushers in pools of illumination that subtly define the distinct locations. On the tour, Orwell's public persona grows confident, even overblown, as he delivers his talks. Meanwhile, the private conversations between him and Carlotta grow increasingly intimate as she tries to understand this enigmatic man — and to convince him to listen to her. Their repartee ranges from combative to friendly, with an undercurrent of sexual tension that Orwell acknowledges immediately. Carlotta, by contrast, works to keep him at a professional distance. For these two weeks, each is all the other has. Caite Hevner Kemp's elegant, restrained scenic design gives us a view of a double bed through French doors in Orwell's hotel suite. Technically, the set piece is unnecessary, but emotionally it's fraught with possibility. Kemp's use of a curved red couch at center stage also creates possibilities — of a bridge or a divide — which Hackett fully explores with his versatile staging. The period costumes by Amy Sutton reinforce the dynamics beautifully, particularly in Act II, when Carlotta's red tailored suit dominates. Ben Montmagny's sound design gives voice to the fictional audience. The ensemble work of Horton and White in the lead roles is riveting. Their fast-paced verbal pas de deux is supported by nuanced gestures. Blocking reveals character when Carlotta underlines points with her hands as she carefully challenges Orwell's actions and motivations; or when the two move from chair to couch to chair — or, in Orwell's case, to the whiskey bottle and back. When Horton steps on stage, he inhabits the role of the Eton-educated Orwell, putting the audience solidly in his corner. Restricted by the gender roles and manners of 1940s America, White must work hard to put across her smarts and not just her sexiness, and she succeeds handily. The small cast also includes Hanover, N.H., seventh grader Trevor Siegel playing a grocery delivery boy who adeptly contends with a brusque Orwell. Hackett, a professor of theater at Dartmouth College, has worked with Sutton on several previous productions and readings around the country. The latter's plays have been produced throughout the United States and in London, and he currently teaches playwriting at Dartmouth. With Orwell in America, the collaboration of these longtime colleagues gives rise to a polished, intelligent production. The original print version of this article was headlined "Imagining Orwell"